If there is one building that every visitor to Manchester (not to mention every resident) must see, it's the town hall. A building founded on cotton and industry, it's a working monument to the trade that made Manchester what it was, from the statues of great men that stand in the entrance ways to the bee mosaics laid into its floor to ceilings that are covered in the coats of arms of Manchester's former trading destinations. The architect, Alfred Waterhouse, even aimed to capture the area's history in its architecture through a series of murals, realised as Ford Madox Brown's twelve scenes in the great hall. Unfortunately, unless you've been invited to an event in the great hall, it's unlikely you've made it up close to Brown's great work of public art. 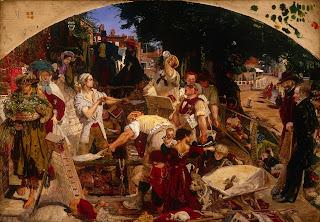 Partly this is because, as curator of Manchester Art gallery's new exhibition Ford Madox Brown: Pre-Raphaelite Pioneer, Julian Treuherz, says, “It's in use all the time. It's a working building”, and partly because the public by and large don't know they are allowed to look around the building. Now, as part of the exhibition, the murals will be freely open most Sundays. When the murals were painted, says Julian, the town hall would have been more accessible (although, he admits, “the very, very poor would not have got through its door”) as it was regularly used as a venue for public meetings. 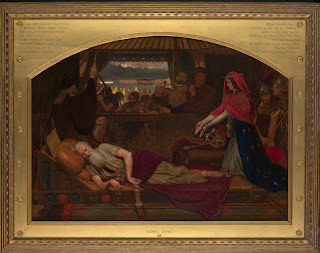 Waterhouse intended art to be an integral part of the building, with murals throughout – though this eventually proved to costly and time-consuming as Brown's murals in the great hall alone took fifteen years to complete. Commissioning murals for the building at all was, says Julian, an act of “complete daring” by the architect following the failure of similar schemes in the Houses of Parliament (Brown's proposals for the Houses of Parliament murals, which were not chosen, are in the Manchester Art Gallery show) and the Oxford Union which, unsuited the the UK's damp climate, soon faded. Waterhouse learned from this and the preparation for murals in Manchester town hall was carefully thought out. Hot air was installed behind the spaces where the murals would go, and stained glass kept to a minimum, free of flashy colours that would shine onto and distract from the paintings. A Gambier Parry style of spirit fresco was chosen, and the walls prepared so that the pigment would react with the surface of the walls – making them “truly architectural, not easel painting”, says Julian, as “they're meant to tell at a distance in this space”. Whilst Waterhouse tried to ensure the murals were a success technically, Brown faced other difficulties. Winning the town hall commission is described by Julian as a 'lifeline' for Brown in the last years of his life, but it was not easy: he suffered from gout and ailments brought about by the cold in the building in winter and a stroke meant the loss temporarily of the use of his right hand. Nor did the council offer their unfailing support, vetoing his plan to end the series of murals with a depiction of the Peterloo Massacre. His painting of the opening of the Bridgewater Canal was also unpopular, with its pomp and circumstance and bright, bawdy colours. Many of the events in the murals have only a “tenuous link to Manchester” as, explains Julian, “Manchester did not really have a history with lots of heroic events and great personalities.” A Roman Fort is built in Mancenion by a worker writhing with tattoos. Christianity is brought to Manchester following the baptism of King Edwin at York. Closer to home the Fly Shuttle is discovered at Bury, jeered by baying luddites. The world famous scientist John Dalton's discovery of natural gases, a pastoral scene, is overlooked by a curious, almost-cartoonish cow. 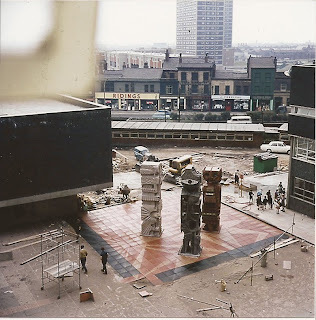 Brown intended the murals to be 'typical' of Manchester's history rather than 'documentary'. In some cases he even imagines how the future might be, envisaging crowds of children at Humphrey Chetham's school. Animals and children recur throughout the pictures, which are often light-hearted. 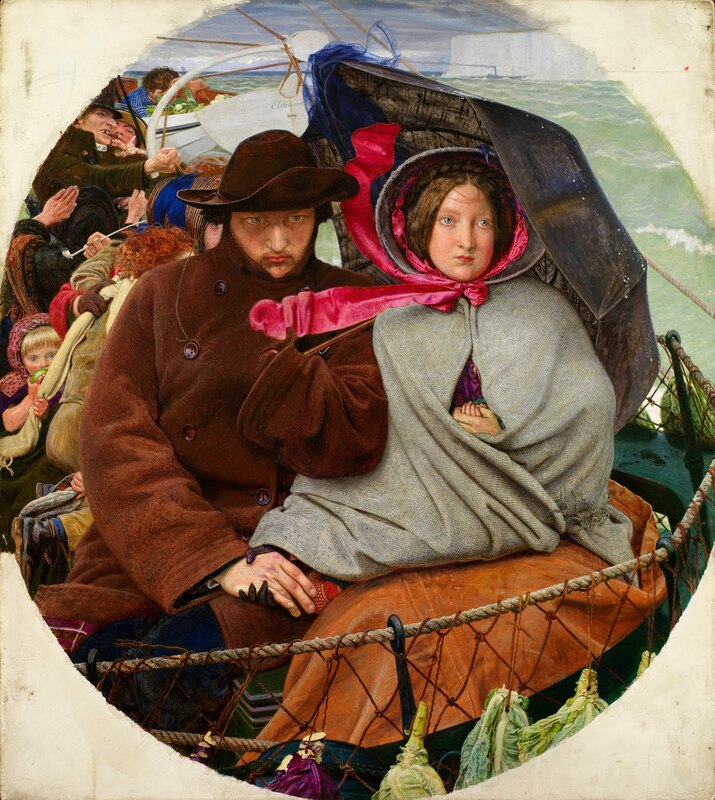 As Julian says, Brown's paintings are humorous, containing “a lot of fun and wit and satire”. He is “anti-hierarchy and egalitarian” as an artist and “emphasises role of ordinary people, has a lot of fun at the expense of authority figures.” He paints his friends, family and patrons into the pictures – and even himself as the Archbishop of Canterbury. As the accompanying exhibition at Manchester Art Gallery shows, Brown was in his element as a storyteller. Passionate about literature, he often depicted scenes from Shakespeare and other great works, for example creating series of narrative stained glass windows both for churches and private houses. 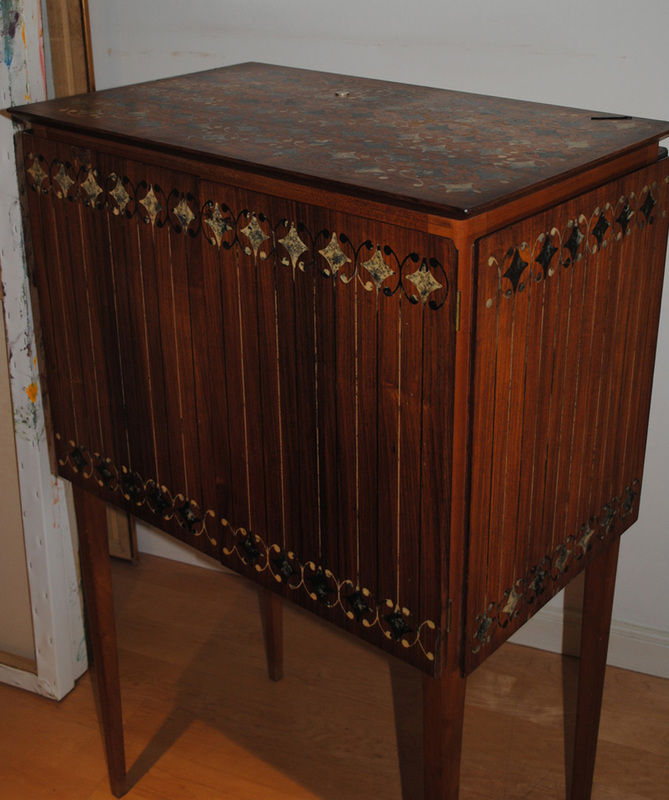 Brown believed in “equality between the fine and decorative arts”, designing many of the frames for his paintings, and the exhibition also displays examples of his furniture. He also excelled as a portrait painter, eliciting a candid directness from his sitters, among them Madeleine Scott, daughter of the famous Guardian editor CP Scott, perched atop a then-fashionable tricycle. Another of his most striking paintings, 'Mauvais Sujet (The Writing Lesson)', which depicts a sensuous young girl biting into an apple, her hair in disarray, shows Brown's concern for society: proceeds went to Lancashire Relief Fund to help those affected by the Lancashire cotton famine. At £8 for entry, perhaps the Art Gallery show is suited to enthusiasts. But even when the exhibition has finished, the town hall murals are accessible to the public – just ask at the front desk and, as long as there are no events on, you should be able to wander the great hall at your will. Ford Madox Brown: Pre-Raphaelite Pioneer, opens at Manchester Art Gallery, Mosley Street, on Saturday September 24 and runs until Sunday January 29 2011. Entry is £8 for adults, £6 for concessions and free for under-18s. "Today it has become necessary to demolish the myth of the 'star' artist who only produces masterpieces for a small group of ultra-intelligent people...the artist must step down from his pedestal and be prepared to make a sign for a butcher's shop (if he knows how to do it). 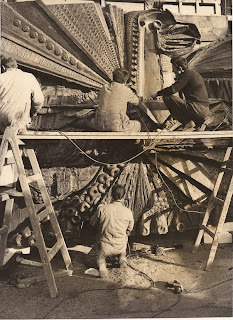 The artist must cast off the last rags of romanticism and become active as a man among men, well up in present-day techniques, materials and working methods. The designer of today re-establishes the long-lost contact between art and the public, between living people and art as a living thing." At the start of July I traveled to London to meet William Mitchell, a prominent post-war architectural sculptor (and innovator in the use of materials such as a new type of concrete called Faircrete) whose work I have been visiting across Greater Manchester and Liverpool over the past year. I spent the afternoon with Mitchell and his wife Joy at their flat in Marylebone, where we watched black and white archive footage from several episodes of Tomorrow's World that were presented by Mitchell (he can't remember exactly when), and their local chip shop, where the couple's lively anecdotes continued (and lunch was paid for with the flourish of a £50 note). We discussed things including: industrial design (Mitchell helped design the first 125 and 250 mph trains, which were tested at Marylebone); Prince Philip's (in)famous reaction "What the hell is that?" 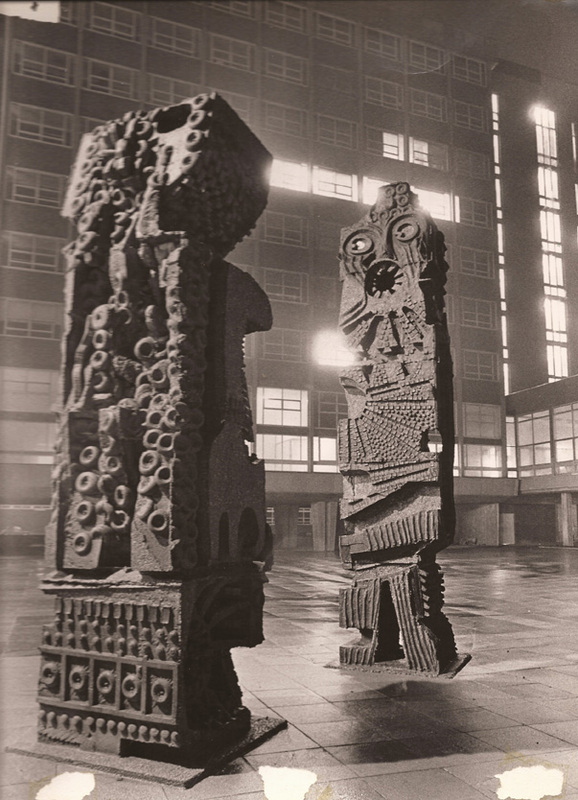 to his Minut Men sculptures outside Salford University (then Salford Technical College) when the Allerton Building was opened in 1967 (ironically, says Mitchell, the Prince had been heard to complain of a "lack of adventurousness" in contemporary architecture, and Mitchell's connection to Prince Philip goes back further, to when they both served in the navy during the war); the big personalities and back stories behind some of Manchester's most high profile buildings (such as the Piccadilly Hotel in Piccadilly Gardens, now the Ramada); his many commissions across the world and working with groups such as schoolchildren; having his own company, William Mitchell Design Consultants Group; Mitchell's numerous, sometimes controversial, speaking engagements; his Dodi and Diana memorial in Harrods; the rediscovery and reassessment of his work, including the renovation of a mural in Hawaii; public space and how to define 'public art'; the dying out of skills such as mosaic making, and why mosaics are not widely commissioned any more; the stigma attached to social housing, even in the post-war period; and the market-led state of art and architecture today ("it's not the quality of the art that makes the headlines but the record prices”). 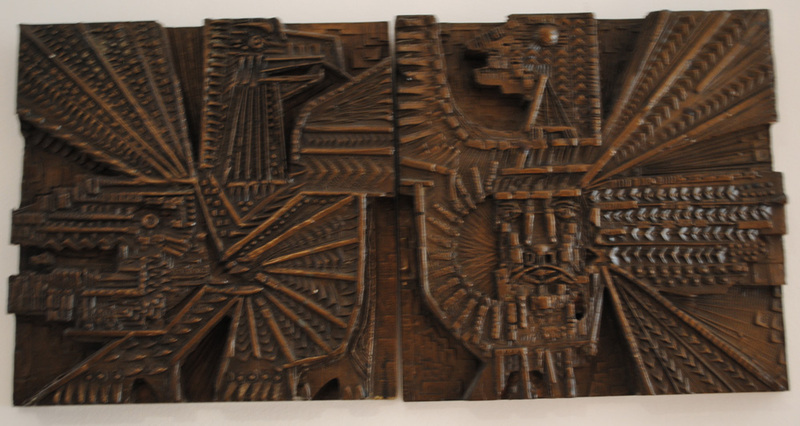 The maquette for the doors to Liverpool Metropolitan Cathedral hangs in the entrance to the Mitchells' flat, which also contains pieces of furniture he made, including two tables in the same style as his mosaic in the Piccadilly Hotel (possibly my favourite Mitchell piece) inset with waste products such as bits of old pianos. "You forget to look at them," said his wife, but the couple kindly moved their furniture around while I took photos. 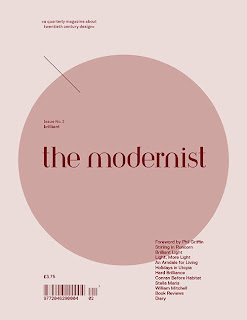 The text below is a slightly longer version of the interview that will appear in Issue 2 of the modernist, accompanied by photos supplied by the Mitchells. 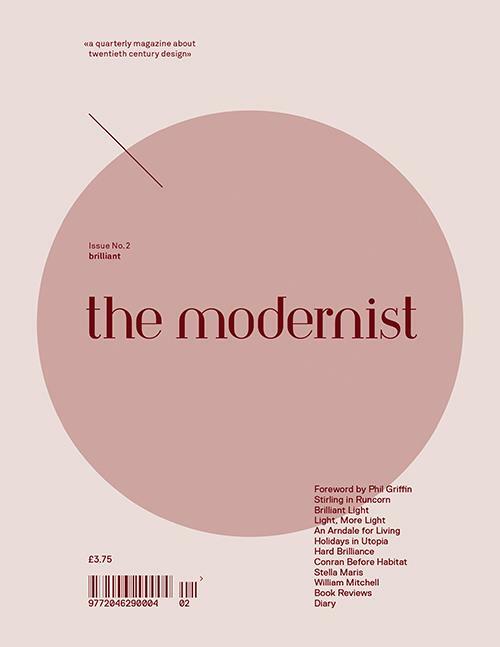 the modernist is quarterly publication produced by Manchester Modernist Society. Issues cost £3.75 each — or £15 for a subscription (including postage). Issue 2, which is themed 'brilliant', also features: Ben Tallis on Orford Ness; Eddy Rhead on the Arndale's Cromford Court set; Stephen Hale on painter Kit Wood; Laura Gaither on Conrad collectibles; Jack Hale on Salford's Stella Maris Salvation Army centre; Matthew Whitfield on Southgate, Runcorn; Richard Brook on Manchester's District Bank; and news and reviews. Issue 2 will be launched, with wine, at Ferrious (in a converted railway arch on Whitworth Street West) on Thursday September 15 from 6-8pm. It will also be available from Cornerhouse bookshop, Magma and RIBA Hub in Manchester, News from Nowhere in Liverpool, Henry Moore Institute in Leeds, Site gallery in Sheffield, Aye-Aye books in Glasgow, Magma and Tate Modern bookshops in London, PLACE in Belfast, do you read me?! in Berlin, Papercut in Stockholm, or online here. A man, armed with a tube, is doodling giant-scale on a concrete wall. Dressed in white overalls he explains, from behind a protective helmet, that he is blasting the wall with grit, enthusiastically advocating the technique's potential for widespread decorative use. The man is William Mitchell, artist, designer, innovator, inventor – and sometime television personality. Mitchell made an entertaining presenter and the programme demonstrating sandblasting was just one of the episodes of Tomorrow's World he was asked to present because “I could talk at the same time and didn't confuse people with art”. He remembers,“I got lots of letters from doctors saying I would die at a very young age as my lungs would be filled with dust and to stop what I was doing” – although at 86 he is still very much alive and opinionated. 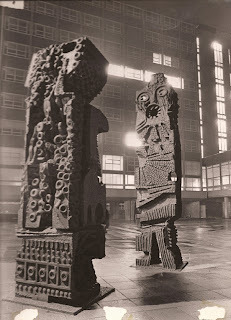 In the 1960s and '70s Mitchell, who had studied Industrial Design at the Royal College of Art, pioneered new techniques and materials, working with other professions such as architects, engineers and builders. In another edition of Tomorrow's World, Mitchell balances on a plank of wood above a building site in Croydon, where he is installing a textured concrete wall in an office block. He explains: “There were not many people in my line of work who would go out on the roof with the builders. That was unusual. If it was now I would have had to wear protective clothing I couldn't even get up the stairs in.” The most remarkable episode, though, is that in which he demonstrates a new technique he has come up with for advertising – an unrealised plan that have illuminated Manchester's Piccadilly Gardens with a 350ft by 65ft sign comprising thousands of lightbulbs triggered by films and photoelectric cells. Mitchell says you can still see the holes on Piccadilly Plaza where the bulbs would have gone. Planners across the UK – and as far afield as America and Hawaii – wanted a piece of Mitchell for their developments, and he undertook hundreds of public and private commissions. These range from the small, functional and unobtrusive – clocks in schools, motorway detailing – to the grand – the massive (in Mitchell's eyes, "almost barbaric") doors to Liverpool Metropolitan Cathedral (the design for which had to be signed off by the Pope) and, later, the Egyptian Room at Harrods. Mitchell was so prolific he can't remember the exact location and details of each artwork, but there are a several in some of Manchester's most striking and iconic Modernist buildings – a bold fibreglass mural in the entrance to the plush CIS Tower, panels around the lift shaft in the snaking Gateway House on Piccadilly Approach and sculptured decoration covering the Humanities Building at the University of Manchester. Often, says Mitchell, his artworks used a “very, very involved process”, a challenge to himself to prove they were possible. He remembers: “It was almost an exercise in character building, the artworks were so hard to get to the finish of!” Another unusual use of materials can be seen in the epic mosaic, gleaming with objects such as bottle tops and textured by the addition of gravel, that climbs the full height of the staircase in the Piccadilly Hotel in Manchester's Piccadilly Gardens. Made of bits of furniture and pianos set in resin, Mitchell says "there's a richness to it". It took up the whole of his studio and he had a whole team sanding it down as he wanted to show “there was still the possibility of doing hand craftwork”. Mitchell finds public art to be a problematic concept: “One of the troubles of public art is the public are not asked whether or not they want it.” Yet you can tell Mitchell is proud of the artworks which people have taken to heart: he was pleased to hear of a fashion show being held in front of the Minut Men in Salford, and recounts that Salford students defended the figures from attack by rivals from Manchester University. He even tells a story of tenants taking it upon themselves to clean one of his artworks in a council block. 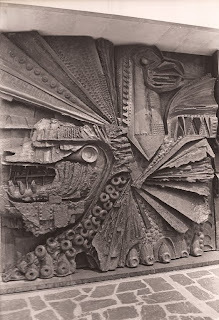 Mitchell also considers his fantastical creatures for the water gardens in Harlow, Essex – modern day gargoyles for a new town – to be a success. 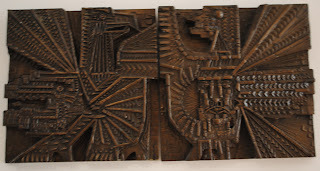 Too often, he says, artworks of the period were “thought of as brooches to stick on the building”, whereas art needs to “give a sense of the international, community and place”. Harlow, he thinks, was different as “they were starting to put an infrastructure in, an environment”. Mitchell would like to see a percentage for public art built into new developments today: “I think it's appalling architects don't consider art. It is so categorised today, art and architecture. There isn't any interrelationship to my mind. At one time there was the possibility of an integrated art form but now you don't get anything like that. 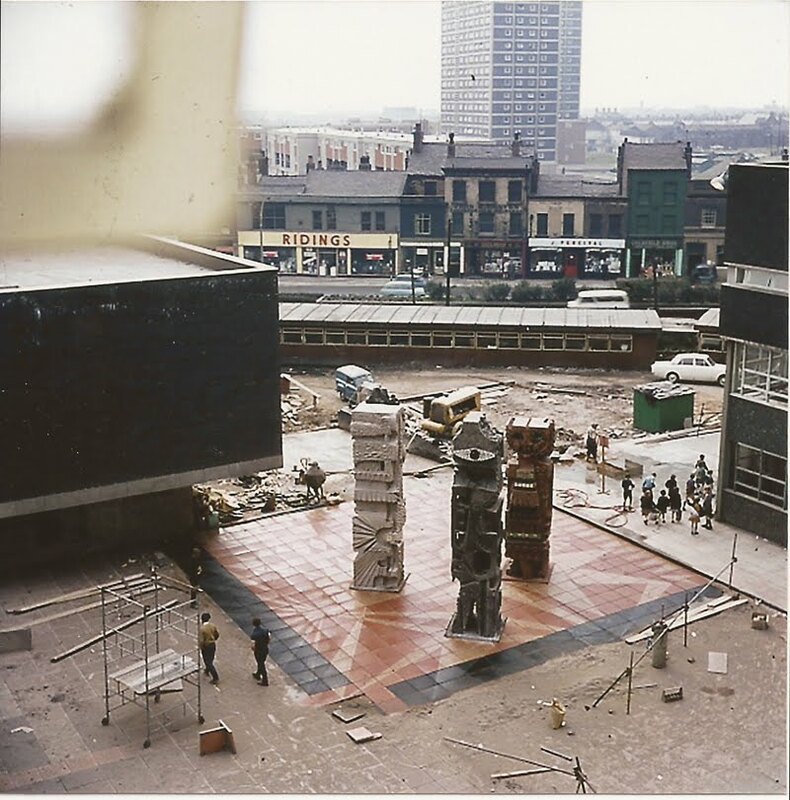 Today, some of Mitchell's works have already been demolished, whereas others are in buildings that have fallen out of favour and face uncertain futures. He's stoical about artworks being lost when buildings are knocked down, although he thinks it's important that “some are kept to give an idea of what the time was like and the type of things you could do”. The social and historical significance of these remarkable artworks is now being reassessed. In Islington, London in 2008, one of Mitchell's works for a school was the first mural of its kind to be listed in its own right, not in the context of the listing of the building to which it was attached. In a library in Kirkby near Liverpool too, a mural has recently been restored and reinstalled. It had languished in storage after the library, ironically, “took it down to be modern”. Those trying (unsuccessfully so far) to get the Turnpike Centre in Leigh listed, which, when it was opened in 1971 featured a new, open-plan library design, also highlight Mitchell's distinctive concrete frieze on the front. Mitchell still receives requests to undertake commissions, mainly from the Far East, where he says "the money is". He is currently working on a book, which will be “part instruction book” (“always paint the concrete”, he insists) and “part adventure book”. There couldn't be anything more appropriate for this brilliant artist. As he sums up his long career, “It has been an adventure! I was a person of my time. Nowadays I'd be put in a box!" 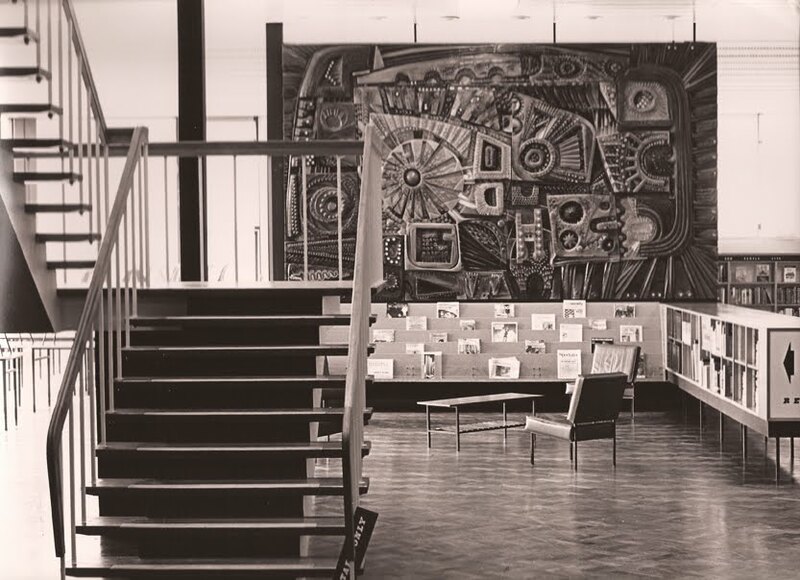 * Rumour has it that some of the moulds still hang in the Modernist bungalow built by the Allerton Building's architect John Parkinson Whittle in Didsbury as his family home. For photos and more information about the works discussed above visit Mitchell's extensive website at www.william-mitchell.com.